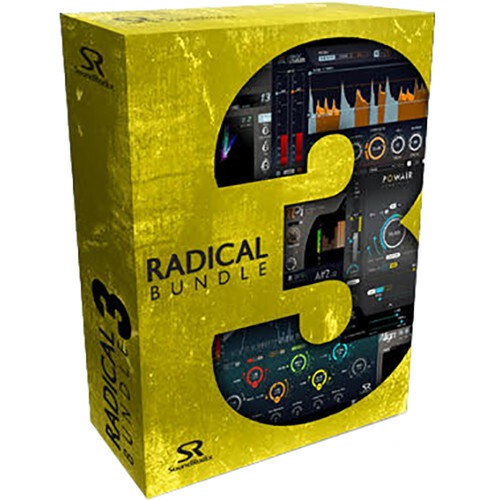 The Radical Bundle 3 Studio Plug-Ins from SoundRadix is a collection of five popular studio plug-ins. The bundle includes: Auto-Align, SurferEQ, PI, Drum Leveler, and POWAIR. These plug-ins can be used by musicians, producers, and engineers on Mac or Window computers for recording and post-production applications and are compatible with AAX, Audio Units, and VST formats. The Auto-Align plug-in automatically time aligns multi-mic recordings with sample accuracy, reducing the comb filter effect, and dramatically improving the sound of the summed tracks. SurferEQ is a pitch-tracking equalizer that allows you to follow a vocal or an instrument's pitch and adjust the EQ frequency accordingly in real time. The Pi plug-in minimizes frequency cancellations between instruments within your mix and brings back the depth and focus lost when overlapping frequencies collide. Drum Leveler is a beat-detection bass compressor/expander, and POWAIR is a two-stage loudness leveler and compressor plug-in that offers greater control and transparency of the source's perceived loudness and intensity. The Pi ­ Phase Interactions Mixer from Sound Radix is an innovative, multi-channel phase interactions mixer plug-in engine for Mac and PC. It functions to improve the summing of a DAW or mixer. Pi minimizes frequency cancellations between instruments within the mix, improves mono compatibility, and brings back the lost depth and focus when overlapping frequencies collide. Designed to enhance any mix, the Pi Phase Interactions Mixer actively rotates the phase of the individual mixer channels to achieve maximum phase correlation within the mix. Pi minimizes negative interaction and significantly improves the overall sound of the mix. Just drop Pi into the last insert slot of your DAW mixer channels and listen. Use any of the 64 groups to bind related instrument channels to enhance your mix even further. Available for Mac & PC in .aax, .rtas, .vst, and .au formats, in 32- and 64-bit wherever applicable. The SurferEQ 2 Pitch-Tracking Equalizer from Sound Radix is an equalizer that automatically tracks the pitch of a monophonic instrument or vocal, and adapts any of its seven bands' frequencies relative to the music, in real-time. This powerful asymmetric, morphing EQ algorithm ensures that the vocal or instrument's natural harmonic balance is maintained, even as the notes change. The real-time pitch detection engine with virtually no octave errors eliminates the need for endless parameter tweaking. Even when it is pushed to its extremes, SurferEQ 2 Equalizer sounds natural. In addition to the high- and low- pass, shelf and bell-shaped filters, the 4-mode harmonic filter controls the entire harmonic series of an instrument using just a single band of EQ. Drum Leveler from SoundRadix is a beat detection based downward and upward compressor/expander that can selectively apply gain to single drum beats, easily achieving the desired target level for each beat without affecting bleed noise, or beats that are out of the user-defined processing range. Traditional envelope followers analyze incoming levels and then apply a VCA for gain changes. Drum Leveler on the other hand runs an advanced algorithm that takes full advantage of the digital domain, allowing extended control over dynamics, improving clarity, and adding punch to any percussive performance. The Auto-Align Plug-in from Sound Radix is designed to listen to multi-microphone recording and automatically measure and compensate for the delay between the microphones or between a DI box and a microphone, sample accurately, significantly reducing the comb filter effect and improving the resulting sound. The software can also detect if the track is reversed in polarity to its counterpart and compensate for it. It comes with a true-stereo algorithm as well as intelligent stereo-to-mono and mono-to-stereo alignment capability. The plug-in is useful in applications where overhead microphones are aligned near to the close miked drums, aligning a dynamic microphone and a condenser in a typical guitar amp recording setup, and aligning a bass guitar DI recording with its miked amp recording. Compatible with both Mac and PC, the plug-in requires an active Internet connection during setup for authorization. The POWAIR Compressor Plug-In from SoundRadix is a dual-stage loudness leveler, compressor, and limiter powered by compression that provides transparency and control. It can be used by musicians, producers, and engineers on Mac or Window computers for recording and post-production applications, and is compatible with AAX, Audio Units, and VST formats. The POWAIR plug-in is equipped with a K-weighted loudness leveler, which is suitable for leveling a voice-over or audio-adjusting the level of different pieces of music. In its second compression stage, POWAIR uses a gain detection and reduction engine, which delivers fast gain changes, minimal distortion, and adaptive response to the source. Furthermore, the punch feature enables full control over the transients' level during the attack stage, making it possible to shape the transients' lengths while keeping peak levels under control. Finally, POWAIR is equipped with adaptive compression. It maintains an average compression action, and adds intensity and glue while keeping the natural dynamics of the recording.